Something about this focal bead just grabbed me when I saw it on ebay. 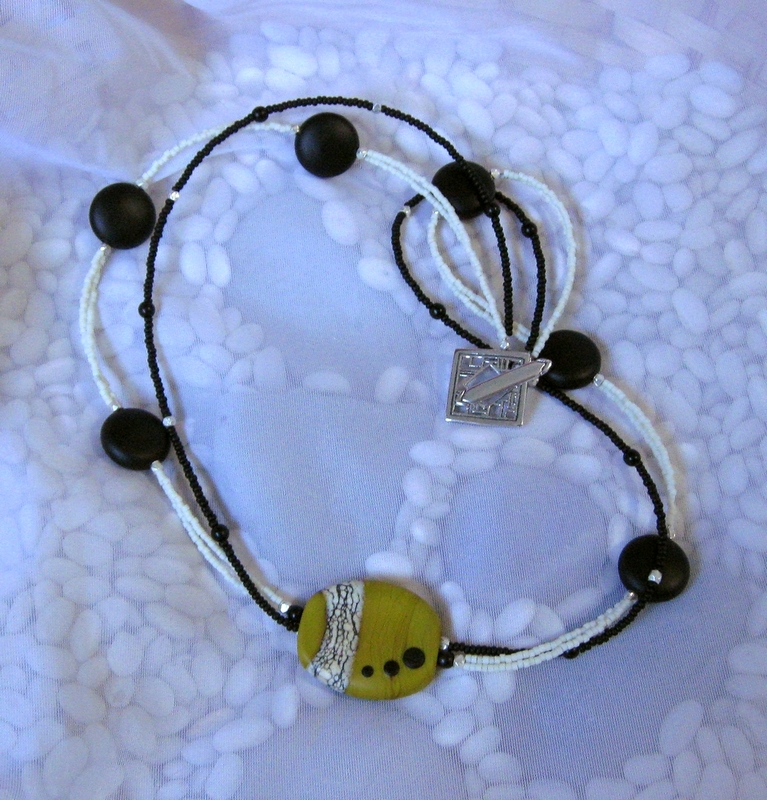 I love Robin’s work – very sensual beads. I did what I usually do when I get a new bead – I held it, stared at it, and thought about it for days before I sat down to do something with it. I had an idea in my head, put it all together and felt . . . . blah. Nope. Didn’t do it justice. I’d used the same matte-finish black beads I used in the finished piece, but had paired them with square beads that (sort of) mirrored the band of white/black/silver on the yellow. Somehow, though, the squares overpowered the focal. It wasn’t right. I sighed, slid them all off the beading wire and worked on something else while I rolled it around my brain a few more times. I hadn’t planned on using seed beads; I feared the focal was too strong for that – but all it needed was a few strands. When I finished, I felt like I’d given this lovely bead, “Wasabi,” as Robin called it, the perfect home. What do you think? Does it work? Matte black, off-white and sterling nuggets that keep that sensual, organic feel in tact. And the sterling clasp, even though one seller called it “stained glass,” reminds me more of Japanese architecture, a silk and bamboo screen, perhaps – just right for a bit a Wasabi.